Anatomy of the human ear and the hearing process. db are so intense that they can severely damage the inner ear, as many jack-hammer operators and rock stars have discovered. The ear is a complex sensory organ, divided into three parts: external (outer) ear, middle ear, and inner ear. 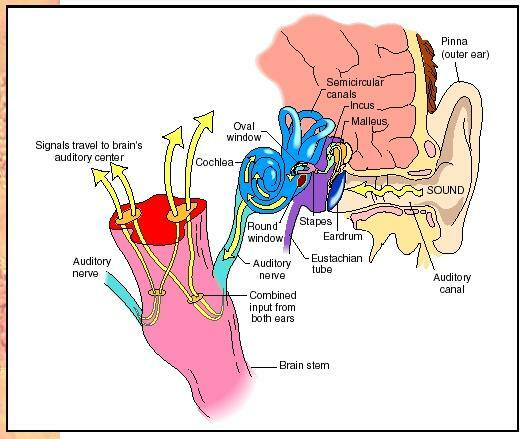 The outer and middle ear help to protect and maintain optimal conditions for the hearing process and to direct the sound stimuli to the actual sensory receptors, hair cells, located in the cochlea of the inner ear. The most visible part of the ear is the pinna, one of two external ear structures. Its elastic cartilage framework provides flexible protection while collecting sound waves from the air (much like a funnel or satellite dish); the intricate pattern of folds helps prevent the occasional flying insect or other particulate matter from entering the ear canal, the other external ear component. The ear (auditory) canal directs the sound to the delicate eardrum (tympanic membrane), the boundary between external and middle ear. The ear canal has many small hairs and is lined by cells that secrete ear wax (cerumen), another defense to keep the canal free of material that might block the sound or damage the delicate tympanic membrane. The middle ear contains small bones (auditory ossicles) that transmit sound waves from the eardrum to inner ear. When the sound causes the eardrum to vibrate, the malleus (hammer) on the inside of the eardrum moves accordingly, pushing on the incus (anvil), which sends the movements to the stapes (stirrup), which in turn pushes on fluid in the inner ear, through an opening in the cochlea called the oval window. Small muscles attached to these ossicles prevent their excessive vibration and protect the cochlea from damage when a loud sound is detected (or anticipated). Another important middle ear structure is the auditory (eustachian) tube, which connects the middle ear to the pharynx (throat). For hearing to work properly, the pressure on both sides of the eardrum must be equal; otherwise, the tight drum would not vibrate. Therefore, the middle ear must be connected to the outside. Sometimes, when there are sudden changes in air pressure, the pressure difference impairs hearing and causes pain. In babies and many young people, fluid often builds up in the middle ear and pushes on the eardrum. The stagnant fluids can also promote a bacterial infection of the middle ear, called otitis media (OM). OM also occurs when upper respiratory infections (colds and sore throats) travel to the middle ear by way of the auditory tube. Sometimes the pressure can be relieved only by inserting drainage tubes in the eardrum. The inner ear contains the vestibule, for the sense of balance and equilibrium, and the cochlea, which converts the sound pressure waves to electrical impulses that are sent to the brain. The cochlea is divided into three chambers, or ducts. The cochlear duct contains the hair cells that detect sound. It is sandwiched between the tympanic and vestibular ducts, which are interconnected at the tip. These ducts form a spiral, giving the cochlea a snail shell appearance. Inside the cochlear duct, the hair cells are anchored on the basilar membrane, which forms the roof of the vestibular duct. The tips of the hair cells are in contact with the tectorial membrane, which forms a sort of awning. When the stapes pushes on the fluid of the inner ear, it creates pressure waves in the fluid of the tympanic and vestibular ducts (like kicking the side of a wading pool). These waves push the basilar membrane up and down, which then pushes the hair cells against the tectorial membrane, bending the "hairs" (stereocilia). When stereocilia are bent, the hair cell is excited, creating impulses that are transmitted to the brain. How does the cochlea differentiate between sounds of different pitches and intensities? Pitch discrimination results from the fact that the basilar membrane has different vibrational properties along its length, such that the base (nearest the oval window) vibrates most strongly to high frequency sounds, and the tip to low frequencies. The hair cells along the length of the cochlea each make their own connection to the brain, just like the keys on an electric piano are each wired for a certain note. Loud (high-amplitude) sounds cause the basilar membrane to vibrate more vigorously than soft (low-amplitude) sounds. The brain thus distinguishes loud from soft sounds by differences in the intensity of nerve signaling from the cochlea. Hair cells themselves do not make the impulses that are transmitted to the central nervous system (CNS); they stimulate nerve fibers to which they are connected. These nerve fibers form the cochlear branch of the eighth cranial (vestibulocochlear) nerve. In the CNS, the information is transmitted both to the brainstem, which controls reflex activity, and to the auditory cortex, where perception and interpretation of the sound occur. By comparing inputs from two ears, the brain can interpret the timing of sounds from right and left to determine the location of the sound source. This is called binaural hearing. Carmen, Richard. Our Endangered Hearing. Emmaus, PA: Rodale Press, 1977. Stebbins, William C. The Acoustic Sense of Animals. Cambridge, MA: Harvard University Press, 1983. Stevens, S. S., and Fred Warshofsky. Sound and Hearing (Life Science Library). New York: Time, 1967.